(The Root) — With the first night of the Republican National Convention wrapped, pundits and news anchors are in a frenzy trying to give reviews and decipher what it all means. The night's biggest star, New Jersey Gov. 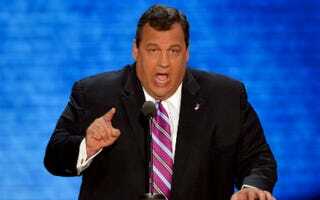 Chris Christie, has garnered mixed reviews — but all say he delivered his speech well. Politico put together 10 rousing quotes from Christie's speech. The only problem: It didn't acknowledge whether they were true or not. It gave his quotes but not the reality that they're supposed to be talking about. 1. "There's only one thing missing now. Leadership. It takes leadership that you don't get from reading a poll. You see, Mr. President, real leaders don't follow polls. Real leaders change polls." Oh? Leadership is missing? I thought it was a reasonable Senate and Congress that was missing. How can you lead when your subordinates above all else want you to fail? As for polls, a lot of times they show where a country is leaning. For instance: Polls show support for marriage equality. Polls show women aren't amused by Republican rhetoric. Maybe, just maybe, it would be reasonable to take a look. 2. "Tonight, we're gonna do what my mother taught me. Tonight, we're gonna choose respect over love." 3. "Now, I know this simple truth and I'm not afraid to say it: Our ideas are right for America and their ideas have failed America." "Our ideas?" You mean Republican ideas or New Jersey ideas? Because if you're talking Republican, sir, you do realize that we did use your ideas. Tax cuts, deregulation, economics trickling on down — but then in 2008, the economy imploded. If it weren't for the leadership of President Obama (see quote 1), we'd be on our way to living underground like in The Matrix. Well, we still might need to at some point. Climate change be cray, son. 4. "They believe that the American people don't want to hear the truth about the extent of our fiscal difficulties and they believe the American people need to be coddled by big government. They believe the American people are content to live the lie with them. They're wrong." I think America is aware of the "extent of our fiscal difficulties." That's why Congress has one of the lowest approval ratings ever. America is wondering "why isn't our government working on these fiscal difficulties"? Why are they legislating uteruses as opposed to legislating fixing the broken ideology that the GOP has pushed for years? 5. "Their plan: whistle a happy tune while driving us off the fiscal cliff, as long as they are behind the wheel of power when we fall." Well, if anyone knows about whistling, it's the Republican Party — but who's happily whistling on the left? The Democrats and the president keep saying things are getting better, but we still have a lot more work to do. I don't recall anybody on the left breaking out into the Dougie yelling mission accomplished in the past four years. 6. "They believe in teachers unions. We believe in teachers." Yes. The GOP is obviously the party of education … I'm sorry. I couldn't even type that sentence with a straight face. Also? Unions helped create and maintain the middle class. Your demonizing of them doesn't make you seem tough. It makes you seem like you don't care about the people. 7. "We win when we make it about what needs to be done; we lose when we play along with their game of scaring and dividing." Scaring and dividing is the Democrats' game? Republicans ran on "scare and divide" every day after 9/11. Scary Muslims, death panels; does this sound familiar to y'all at all? 8. "It's time to end this era of absentee leadership in the Oval Office and send real leaders to the White House." Absentee leadership? Or obstructionist Congress? Didn't Obama bring a jobs bill, the DREAM Act and various others, and wasn't he stopped every time? I know you're in New Jersey, but is the smog that bad that you can't see what's been happening? 9. "Our leaders today have decided it is more important to be popular, to do what is easy and say 'yes,' rather than to say ‘no' when ‘no' is what's required." Actually, the Republican leaders have said "no" pretty regularly. Perhaps you guys should try a yes now and then. 10. "We all must share in the sacrifice. Any leader that tells us differently is simply not telling the truth." Who is he talking about? Who's "all"? Republicans specifically refuse to have "all" of us share the sacrifice. Your leaders are signing pledges that they'll never raise taxes. The Bush tax cuts have almost doubled our national deficit. Who's "all"? Is it just unions and poor people? Is that the new definition? If so, just tell me! I haven't picked up the new Jersey Shore Unabridged Dictionary yet. Can you send me one? Or would that be a government handout? I don't know the rules anymore. #SayAnything2012 is in full effect. Elon James White is a writer and satirist and host of the award-winning video and radio series This Week in Blackness. Listen Monday to Thursday at TWIB.FM and subscribe on iTunes. Follow him on Twitter, Facebook, Google+ and Tumblr.